Meat Lasagne Recipe in English is an easy and traditional cooking recipe to prepare at home. 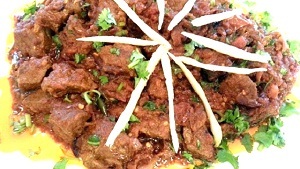 It provides you an awesome taste of Beef & Mutton Recipes. 1. Boil lasagne with salt till tender, strain and keep in cold water then strain again. 2. Brown onions in a little oil, add mincemeat, pepper, salt and spices, cook till water evaporates. 3. Grease ovenproof square dish and put a layer of lasagne, mince, tomato paste, then pour white sauce and little bit of grated cheese and repeat. 4. The top layer should be of lasagna. Sprinkle grated cheese, on it. 5. Preheat oven and bake for 20 to 25 minutes, take out the dish put cream and then place under grill for 10 minutes till brown on top.